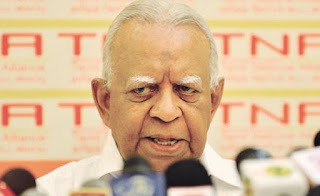 Tamil National Alliance (TNA) leader R. Sampanthan asked in Parliament as to how the new political party Sri Lanka Podujana Peramuna (SLPP) could dispense with Sri Lanka Freedom Party (SLFP) founded by the late S.W. R. D. Bandaranaike. Making his remarks during the debate on an adjournment motion, Mr Sampanthan, who is also the Opposition Leader, said the SLFP was sought to be dispensed with. “There is coming into existence a new political party called the Pohottuwa, or the SLPP, which is said to be comprised of - I am not saying, comprising of I am saying, said to be comprised of - even some senior members of the SLFP. “I want to raise a question in Parliament and raise it before the whole country as to how it can ever be possible for anyone to dispense with the party founded by the late S.W.R.D. Bandaranaike in the 50s when he resigned from the then UNP Government and crossed over to the Opposition. “It was a party which he led, a party through which he governed, a party through which several of his successors governed in this country, how that party can be abandoned in favour of the new party that came into existence just a couple of months ago? he asked. Besides, he said the Provincial Council Elections must be held. “They are important, they cannot be delayed and they must be held early,” he said. “But, before the Provincial Council Elections are held, to make the provincial autonomy meaningful, something that will effectively give power to people at the provincial level, the new Constitution that we are proposing, must be enacted, addressing primarily the three main issues referred to by the Mover of this Adjournment Motion: the National Question, Provincial Governance, Provincial or Regional Autonomy, Executive Presidency and the new Electoral Reform Process,” he said.